Thierry Neuville (Hyundai Motorsport) wins the Rally Poland, the 8th round of the 2017 FIA World Rally Championship, scoring his fifth WRC victory in a career. 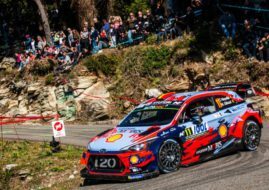 For Neuville, it’s the third win of the season and he reduced a gap behind the championship leader Sebastien Ogier (M-Sport Ford), who finished third in Poland. The Belgian driver reached the top podium spot after an epic fight against Estonian Ott Tanak in a Ford Fiesta. They swapped their places in two leading positions four times on Saturday. Neuville ended a day with 3.1sec advantage. On Sunday morning, Tanak was fastest on SS20 and jumped into the lead with 1.8sec advantage. Unfortunately for Tanak, his speed forced him to make mistakes. The one he made on the Special stage 21 cost him a retirement. He hit a bank with a rear and then hit a tree with a front of his Fiesta. Tanak managed to reach the finish line, losing more than 100 seconds, but he retired because of too much damage on his car. Tanak’s misfortune promoted Hyundai’s Hayden Paddon to P2, with more than a minute gap. Sebastien Ogier prevents Hyundai’s 1-2-3 triumph, finishing the event 26.6 seconds ahead of Dani Sordo. The big surprise is the sixth place for Finnish youngster Teemu Suninen in his first ever drive with 2017-spec Ford Fiesta WRC. He even scored one stage victory on Friday. He was fifth overall until the last special stage when he spun and lost one place to Stephane Lefebvre (Citroen). 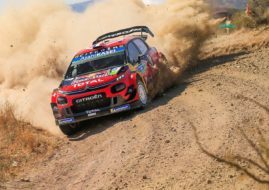 Other point-scorers in the Top 10 are Mads Ostberg (Ford), Elfyn Evans (Ford), Andreas Mikkelsen (Citroen) and Juho Hanninen (Toyota). 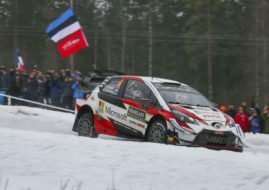 Jari-Matti Latvala (Toyota), who retired on Saturday due to technical problems on his Yaris, restarted on Sunday to score five points by winning the Power Stage. Other drivers who scored additional points at the Power Stage are Ogier, Mikkelsen, Lefebvre and Neuville. The next championship round is the 67th Rally Finland, scheduled for July 28-30.